In my many years of supporting Mail Order Manager, one of the most important items that is often overlooked or emphasized is the importance of daily backups. If you are running your business on any software solution, it is essential that you have a backup in case of an unforeseeable event such as a PC crash, hard drive failure, or data corruption, etc. Too many times I have spoken to customers who experienced one of these events where a full restore was necessary but did not have a recent backup. Also, customers may have contracted out to an IT firm to install an automated backup system, but either the backup was never tested to determine if the data being saved contained a fully working copy of the entire MOMWIN folder, or they were never instructed on how to restore if needed. To eliminate any possible issues regarding automated backups, a manual nightly backup should be done. There is no such thing as overkill when it comes to backups. Having redundancy often saves many businesses a lot of time and money. After all users are logged out, locate the M.O.M. folder on the server. Create a folder on another hard drive on the network. Right click on the M.O.M. 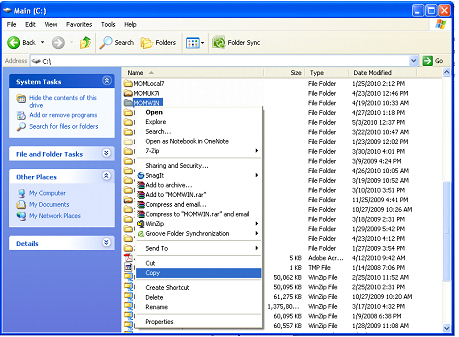 folder and select COPY, then open the MOMBACKUP folder and paste the copy there. Along with storing the backup on another PC, it is advisable that the copy be saved on portable media such as a USB drive or external hard drive. The best method of periodic backups would be to create 2 or more folders so you can have a backup from more than 1 day (ex: create 5 folders on your backup location labeled MOMbackupMon, MOMbackupTue, MOMbackupWed, etc.). Keep a separate backup for each day of the week. 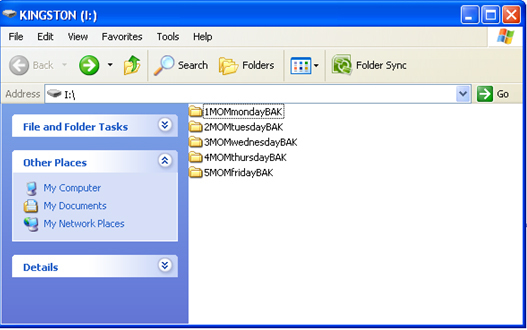 At the beginning of the following week you can begin overwriting the previous week’s backup. After creating your daily folders, select the day you are backing up, open this folder. The location below is a USB drive, however, it can be on any other hard drive on your network. Simply right click in this location and hit PASTE. The date that this folder was created will be recorded based on the time/date of your PC. If you have any questions, comments or suggestions about creating back-ups, please submit a comment on this post and we’ll be happy to address them. This entry was posted on Monday, May 10th, 2010 at 12:00 am	and is filed under Support. You can follow any responses to this entry through the RSS 2.0 feed. You can skip to the end and leave a response. Pinging is currently not allowed.